Gor Mahia coach Hassan Oktay during a training session at Camp Toyoyo grounds, Nairobi (file photo). 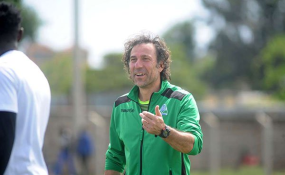 Nairobi — Gor Mahia's Hassan Oktay has been named the Fidelity Insurance Kenyan Premier League coach of the month for February after leading his side to a run of four wins and a draw in five matches. The Cypriot who took charge of the team at the start of the new season in December beat Sofapaka's John Baraza and Posta Rangers' John Kamau to the gong after receiving the most votes from the Sports Journalists Association of Kenya (SJAK) football committee. Oktay led K'Ogalo to victories over arch rivals AFC Leopards, Vihiga United, Sofapaka and Tusker FC while they drew 1-1 with Western Stima.